The economic gains and opportunities contributed by the fast-growing micro, small, and medium enterprises (MSMEs) are undeniable. As of 2016, MSMEs comprised 99.57 percent of the businesses in the country, contributing 63.3 percent of the employment for the same year. Under the Duterte administration, two landmark legislations have been passed to help small businesses: first, the Tax Reform for Acceleration and Inclusion (TRAIN) law Package 1, and second, the Ease of Doing Business and Efficient Delivery of Government Services Act of 2018 or Republic Act (RA) No. 11032. TRAIN law Package 1 amended the monthly tax filing of percentage taxes to quarterly filing, introduced an optional eight percent flat rate based on gross sales in lieu of both percentage and income taxes, and most importantly, lowered the personal income tax for small businesses registered as self-employed with the Department of Trade and Industry (DTI). RA 11032 aims to improve our competitiveness and reduce the cost of doing business especially for small businesses. President Duterte reiterated during his third State of the Nation Address (SONA) the importance of passing TRAIN Package 2 and the rest of the Comprehensive Tax Reform Program, which is intended to make our tax system simpler, fairer and more efficient. The TRAIN law may have triggered inflation, but it brings a lot of investment and growth opportunities for small businesses to expand their operations due to the lower income tax rates. Under the proposed TRAIN Package 2, even the corporate income tax will be reduced from 30 percent to 25 percent, or even 20 percent. This is a green light either for small businesses to explore the possibility of expanding and growing their business, or for budding entrepreneurs still planning to start a business. Franchising your business or getting a franchise might be for you. The Philippines has already proclaimed itself the “Franchise Hub of Asia” as the industry continues to grow in the country. Franchising no longer only refers to large-scale businesses such as fast-food chains or convenience stores. MSMEs have also been noticeably expanding their businesses through franchising. Food carts can be found in train stations, around malls and even just along sidewalks. Businesses who are thinking of expanding might wonder whether they should simply open just another branch, or turn their business into a franchise. Franchisees no doubt benefit from the operational aspects of franchising, such as having an already established brand, lower risk and receiving assistance whether it’s in marketing, operations or training. However, since expansion is more the businesses of the franchisor than the franchisee, how exactly can franchising benefit MSMEs? There are operational benefits to franchisors as well. Rapid expansion can be achieved since it requires a lower capital to franchise a business and since most of the capital will be handled by the prospective franchisee. The lower capital investment also means that there is a much faster return of investment. Since franchisees rely on the success of their business as well, franchisors can also benefit from a more efficient management of their business. However, as a franchisor, do remember that it will be different from simply running your previous business. Your products will be your brand, your business plan and your business model. As such, you need to develop them so that they will attract franchisees. In addition, you should support your franchisees with sufficient aid in marketing or training. Your business will rely on your franchisees, and as such you need to choose them carefully—and not simply sell your brand to the first buyer. This goes both ways, as your franchisees will be careful in picking their franchisor as well. Of course, those are the most common reasons easily scattered throughout the internet with a single search. 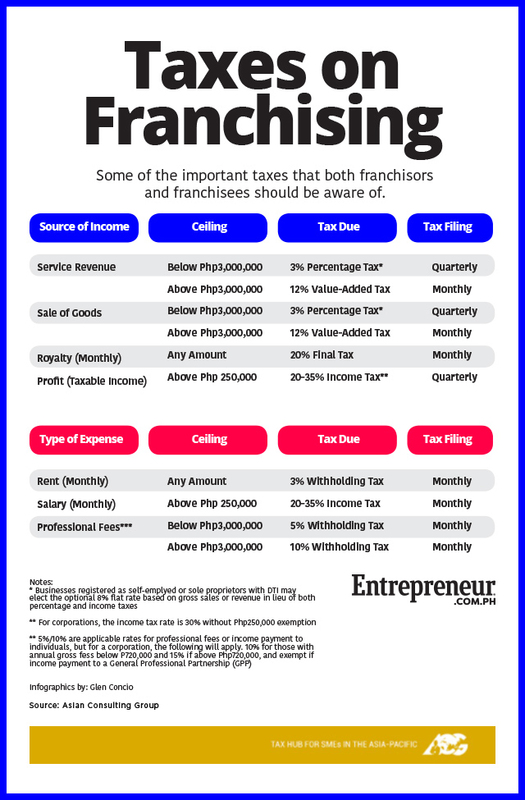 Aside from those, there are more in-depth ways to maximize the benefits of franchising, particularly through taxes. At first glance, franchises only pay the regular taxes since, after all, there is no special law governing franchises or its taxation. Those who are planning to start a business by getting a franchise have to withhold a 20-percent final tax on the royalty payment due to your franchisor. You may also elect the optional eight percent if your gross sales will not exceed Php3 million. Of course, this is a very general and simplistic way of discussing the taxes you need to pay even before you franchise your business. Just remember: the saying “what you don’t know won’t hurt you” doesn’t apply to taxation. As a matter of fact, it’s the other way around. What you don’t know will cost your business hefty penalties and compromises. But you don’t have to be discouraged in growing or franchising your business. Tax is simply another operating cost. You just have to manage it well to avoid spending more than necessary. To minimize taxes without breaking any regulation, businesses should engage in strategic tax planning that can ensure no penalties, fees and compromises will arise from lowering tax expenses. Attending tax seminars especially about the new TRAIN law would help, but it’s best if business owners attend an Executive Tax Briefing (ETB) for CEOs or Exclusive Tax Coaching (ETC) for Startups and Small Businesses and find out how Citizen Tax Planning can help you grow your businesses without having to worry about your taxes. Visit www.acg.ph or email consult@acg.ph to know more how you can save from unnecessary taxes, penalties and compromises. You may also call us at (02) 622-7720 for scheduling.